Australia announced Friday it will take Japan to the International Court of Justice to argue that its annual Antarctic whale kill violates international obligations, in a major escalation of the Australian campaign against the hunt. The decision to take legal action against Australia's important trading partner underlines the government's "commitment to bring to an end Japan's program of so-called scientific whaling" in the southern seas, Environment Minister Peter Garrett and Attorney-General Robert McClelland said in a joint statement. The Australian government has said the hunt is in breach of international obligations, but has declined to release any details of how it will argue its case before the court in The Hague. Japan's Foreign Ministry said it was regrettable that Australia was bringing the issue before the court while negotiations continue within the International Whaling Commission on disputes over whale hunts. "We will continue to explain that the scientific whaling that we are conducting is lawful in accordance with Article 8 of the international convention for the regulation of whaling," said ministry Deputy Press Secretary Hidenobu Sobashima. "If it goes to the court, we are prepared to explain that." Sobashima said the issue "shouldn't jeopardize the overall good relations between Japan and Australia." Australian Foreign Minister Stephen Smith echoed that sentiment, saying the two countries have agreed to treat the matter as "an independent legal arbitration of a disagreement between friends." The International Whaling Commission is separately trying to resolve long-running disputes over the hunting of whales by several countries despite a 25-year-old moratorium on hunts. The plan would effectively allow commercial whaling for the first time since the ban, but under strict quotas. Commission chairman Cristian Maquieira expressed optimism Thursday in Washington that the issue could be resolved at a meeting next month in Morocco. But senior U.S. official Monica Medina said the current proposal would allow the hunting of too many whales, signaling difficult negotiations ahead. Japan, Norway and Iceland, which harpoon around 2,000 whales annually, argue that many species are abundant enough to continue hunting them. They are backed by around half the IWC's 88 member nations. Australia has declared the southern seas a whale sanctuary and has long lobbied for an end to whaling there. A panel of lawyers and conservationists reported to the Australian and New Zealand governments last year that Japanese whaling in the Antarctic could be stopped if Japan were held accountable for dumping waste and for undertaking hazardous refueling at sea. The Canberra Panel said that activity violates the 46-member Antarctic Treaty System, to which Japan belongs. Don Anton, an international law professor at Australian National University in Canberra, said Australia could argue that Japan is abusing its rights under under the whaling commission's 1946 Convention, which allows for scientific whaling permits. Australia could claim that the number of whales Japan kills each year is far more than necessary for scientific research, that nonlethal research alternatives exist and that there is a commercial aspect to the scientific program. Australia could also argue that Japan has failed to conduct an adequate environmental impact assessment before engaging in whaling as required by the Madrid Protocol to the Antarctic Treaty, Anton said. 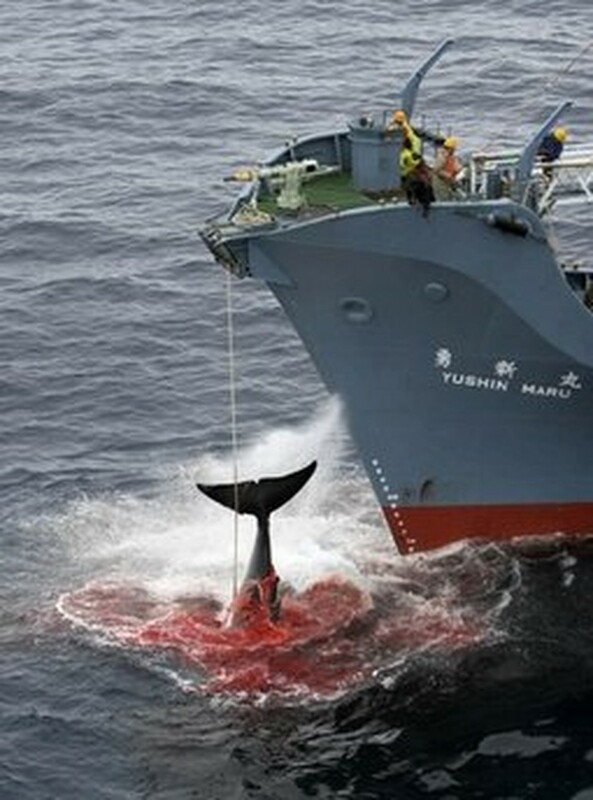 The annual Japanese whale hunt also is a target for protests by conservationists, with vessels of the U.S.-based Sea Shepherd Conservation Society sometimes clashing with the whaling fleet. Sea Shepherd activist Peter Bethune, who boarded a Japanese whaling ship as part of a protest in February, pleaded guilty in a Tokyo court on Thursday to charges including trespassing and destruction of property. The 45-year-old New Zealander could face up to 15 years in prison. Prime Minister Kevin Rudd's center-left Labor Party was elected in 2007 on a promise to take Japan to court to end what Australia argues is commercial whaling in disguise. Rudd later said Australia would focus on diplomatic efforts to persuade Japan to end its annual whale hunt. The announcement Friday delivers on Labor's promise, months from an election on a date to be announced late this year.